It looks different. It acts different. There's no right way to hold it. It responds to the touch of your fingertips. It's the Internet in your lap. It connects to the world, yet it is as personal as a well-worn book. Taking Your iPad to the Max is written so that anyone, from a computer-savvy teenager to a 92-year-old great-grandmother, can quickly get up to speed on Apple's latest hit. As bloggers at The Unofficial Apple Weblog (tuaw.com), we have the happy privilege of working with Apple products every day. The iPad is so different from any computer you've ever used, and we realize many people could use a helping hand, to feel comfortable buying and using an iPad. We take you from selecting and buying an iPad, to connecting it to the Internet, and then demonstrate just how to use the incredible power of the iPad and all its apps to enhance your life. Whether you're using your iPad to surf the Internet, admire family photos, listen to music, watch movies, or read a book, we're here to guide you. We show you how your iPad can be a virtual shopping mall, opening the door to purchases of music, books, videos, and movies. We help you organize your daily life through the use of Calendar, Notes, and Contacts, communicate with friends and colleagues with Mail, and find your way with Maps. The iPad is more than the ultimate leisure device; it's also a work tool. 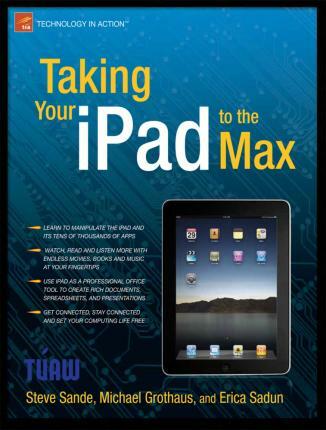 Taking Your iPad to the Max guides you through the basics of Apple's iWork suite for iPad. Learn to create business or personal documents with Pages, make professional presentations with Keynote, and keep data and finances under control with Numbers.